All email enquiries welcome - please provide pictures if possible. Our company is based in East London, I've lived in east London my whole life, Been in the trade for coming up to 20 years', completed a 6 year apprenticeship jib gold carded electrician. We are open to jobs both in and around London. Want a light installed? We do that. Want a switch replaced? We do that. Day to day maintenance, Rewiring, Emergency Lighting, Fire alarms, Testing, Fault finding, EICR testing, Smoke detectors, Communal lights works, Landlord works, Kitchen and Bathroom electrical work. You can find us on WhatsApp 24/7 and we can FaceTime, 07834637900, this will save you time as we won't need to travel out to quote for works. We charge minimum 1 hour then every 30 minutes after or we can give you a fixed price. 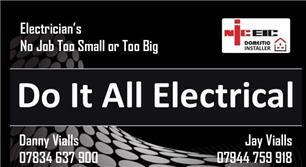 most of our small electrical jobs are completed within 1 hours as we like to have materials on our vans saves time and you money. Clients information is only used for purposes of invoicing and reports. It is not used for marketing or given to third parties.